Two of my objects traveled with me to West Sussex and Dartmoor last week. I wondered about what I would learn from taking them on holiday. In both of the places we stayed I found an object which seemed to be a companion piece to my blue and gold demitasse. In Sackville house on the windowsill of the smoky dining room was the pitcher above. I placed my demitasse beside it and was amazed by the repetition of form and colour. Again at Higher Lettaford (this time in my bedroom), I found a parent(?) Another jug, a guide to the National Park and our precious game of flummoxed created a credible still life. My other object was the inkwell. 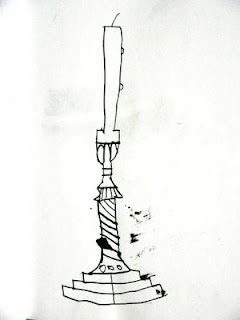 Perhaps its presence had a subtle impact too... Freddie has taken to pen and ink! And I have some ideas for how to use his images, and the inkwell in the future. We have been traveling and Freddie (age 8) has been working in pen and ink to capture life in England. He is visiting from California and his picasa website has wonderful detailed drawings of lego characters. Now using a quill pen, Freddie has directed his keen observational skills to find the essence of subjects he finds interesting. 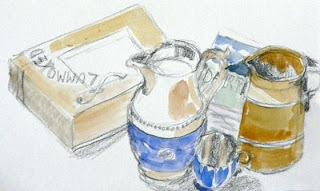 The addition of watercolour adds another dimension to what he has found on the kitchen table.